To inaugurate the D.G. 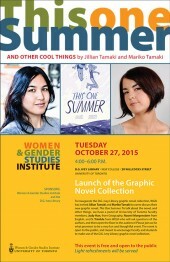 Ivey Library graphic novel collection, WGSI has invited Jillian Tamaki and Mariko Tamaki to come discuss their new graphic novel, This One Summer. To talk about the novel, and other things, we have a panel of University of Toronto faculty members, Judy Han, from Geography, Naomi Morgenstern from English, and Sarah Trimble from WGSI who will ask questions of the authors, and then open the floor to the audience! Please join us for what promises to be a very fun and thoughtful event. The event is open to the public, and meant to encourage faculty and students to make use of the D.G. Ivey Library graphic novel collection.